Click on the letter to read what he wrote to me. I don’t remember what I wrote back, but I probably didn’t say, “Are you crazy?” Why did he feel he had to marry her? Are they still married today? They bought a house and had a couple kids. That’s all I know since he doesn’t write anymore. Why did you choose this writing path? What would’ve happened if you hadn’t chosen it? Could there have been something better? And would your friends tell you if you were making a mistake? Would they be right? Have you made good steps? 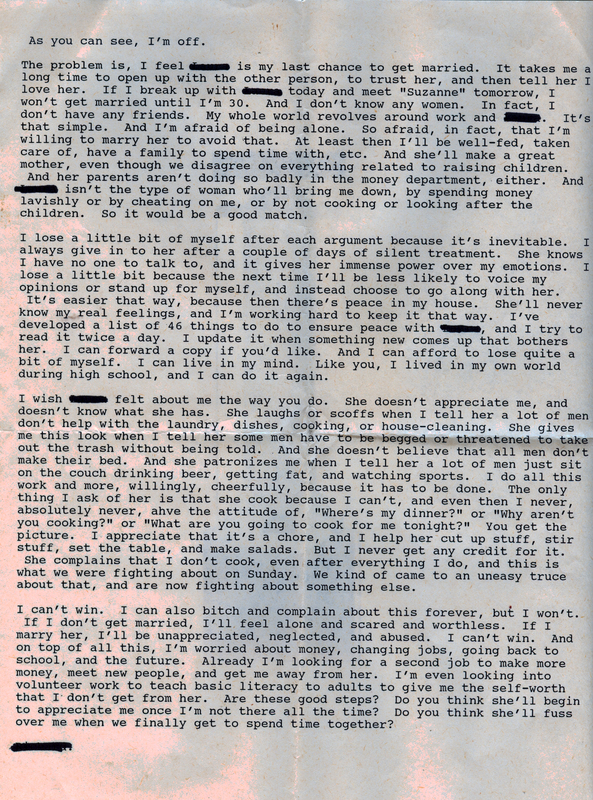 He chose neglect over loneliness, and God help me, I don’t see a huge difference. That letter just makes me want to weep. I’d rather be lonely than abused. I tried to tell him it wasn’t the end of the world not to be married, but he had his way of looking at things. I don’t know how to answer any of your questions. They’re all really good and I don’t know the answer, not to one of them. Well, no one said you to have the answer right this minute. It’s lonelier being in that kind of marriage than being alone. Too bad people can’t see that pre-commitment. Looking back, I can see I started pursuing a career in writing as a way to anchor myself in the world. To have something of my own, something I control. I laugh at that now, because of course, because publishing is the most nebulous, unpredictable, uncontrollable industry I could have chosen. But the writing still anchors me. I will be forever grateful that my parents taught me (or helped me understand) that there was nothing inherently terrible about being alone. Ye gods, that’s pathetic. I hope this poor fellow became a bit more confident and realised he didn’t deserve to be a doormat (and that you have to lie down to be one.) Very sad. I don’t know what he learned. I suggested he and his wife go into marriage counseling… I haven’t heard from him since. No one ever tried to argue me off the writing path. But maybe that’s just because everyone who might have done so had probably, at some point, told me I should be. Writer. They’d effectively pre-empted themselves, ha. And now, it feels like there’s no going back. Here I am, success or failure, even if I write nothing but drafts and blog posts (and, ha!, also long-winded comments) from here on. Damn you smartphone! How smart can the thing really be if it can’t handle a letter. Not pixelated enough for it? Some sort of tech-hatred for paper? Read the letter when you can–I’ve been looking forward to your response. Is there a right path? There are so many paths–who can say which is the right one? It is right enough for me, and a little late to turn back since I’ve got no pension plan and am too old to start working in the mailroom of a Fortune 500 company. That is SOME letter. I’m reluctant to say too much about it, because I can totally see how he could have come to such a pass. People don’t need any particular motivation for self-destructive behavior, after all. But if they have motivation, wow… And loneliness, or just the fear of it, can be a really powerful motivator. All that said, I hope he worked it out to his satisfaction (although I don’t see how it could end up satisfying all around). The fellow who wrote it used to be a friend, so I can’t be sure how this reads to people who didn’t know him. This might tell you more. I wish I knew how things have gone since then.